Hurricane Katrina is a distant memory for many Americans, but for some volunteers who saw the devastation first hand, assisted as long as possible and returned home, closure has been difficult. Count me among them. That is until Oct. 15-17, when I returned to Slidell, La., with about 50 Noah’s Wish volunteers for a five-year reunion. We saw a rejuvenated and rebuilt city of approximately 30,000 on a sun-kissed, low-humidity weekend, a sharp contrast to the flooded residences, downed trees, daily high humidity and a bustling emergency pet shelter that eventually handled 1,800-plus animals from Aug. 31-Nov. 21, 2005. 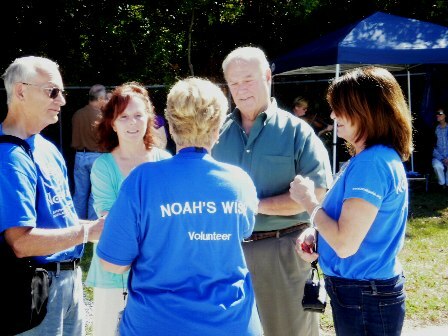 Ranny Green, left, and other Noah’s Wish volunteers visit with Slidell mayor Freddy Drennan during the group’s five-year Hurricane Katrina reunion in the Louisiana city Oct. 15-17. Slidell, situated on the north shore of Lake Pontchatrain, took the brunt of Katrina’s 1-2 wind/water knockout blows of 160 mph and a storm surge of 13 to 16 feet, overwhelming all of the city’s levees. I journeyed to Slidell as a journalist and a convergent volunteer for Noah’s Wish, the nation’s premier pet-disaster relief organization. I was given full access to everything from daily organizational meetings to unloading giant trailers with donated supplies to venturing about the city once or twice daily with animal-control officer David Bergmark, answering calls about homeless animals or entering homes where they were left behind by fleeing owners. After almost two weeks of 14- to 16-hour work days, it was time to leave the humidity, heartbreak and hospitality and return home to family and work. Psychologically, this was the toughest part of the endeavor. I was leaving behind teammates as another big hit (Hurricane Rita) was fast approaching. Hurricane Katrina and Noah’s Wish changed my life forever. Upon retiring from The Times after a 36-year career, my No. 1 passion became pet disaster volunteer work. That transition melded smoothly, but there was still the matter of Katrina closure, after my abrupt Slidell getaway with fellow Seattle convergent volunteer April Laine (who had a rental car) and our two adopted dogs (see The Seattle Times story). But last month’s reunion helped quell the job-left-undone emptiness and was highly re-energizing with hugs from former teammates and a few of the locals whose animals we fostered for weeks. A couple of months ago I contacted Bergmark, and asked him to select a favorite local restaurant (my treat) where we could dine together and reminisce. 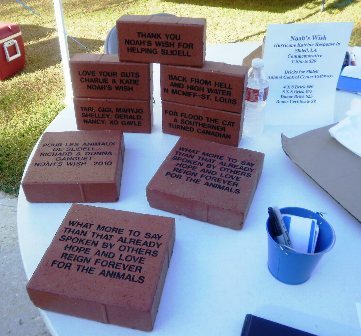 Memorial bricks that will eventually line the walkway leading to the shelter were sold at the reunion. Slidell Animal Control director Damian Anti, who worked tirelessly with Noah’s Wish founder Terri Crisp in the initial quick response and set-up, also lauded the tireless determination and commitment of both agencies in the overall success. “We were all dogged tired every night, but everyone placed the welfare of the animals No. 1. Sure, there were some frayed nerves and testiness, but that happens without rest and everyday challenges such as store closures, high temperatures and humidity, lack of fresh water and places to shower. A teary-eyed Slidell mayor Freddy Drennan addressed the Noah’s Wish volunteers at the reunion, “All of the media attention was directed on New Orleans. We here in Slidell were the forgotten people, but not by you. God bless you and all of the others who came to help us. The animals you helped save are important members of people’s families, and I continue to receive thanks from the people of Slidell for what you did to help us. While Katrina wrought plenty of havoc, destruction and death on Slidell, two positive legacies emerged. A $3 million Slidell Animal Control shelter, dedicated earlier this year, was built almost entirely with funds donated by Noah’s Wish. The loss of an untold number of pets left behind prompted Congress to approve the Pets Evacuation and Transportation Standards Act signed by President Bush in 2006. It requires emergency-preparedness authorities to include in their plans accommodations for household pets and service animals. States that fail to comply could be in jeopardy of losing disaster relief funds. But Louisiana acted earlier. On June 27, 2006, Gov. Kathleen Blanco signed the Louisiana Pet Evacuation bill, stipulating that the state will assist parish and municipal governments in their efforts to evacuate and provide shelter and care for pets during a disaster. Animals will be marked with a bar code tag, a copy of which will be given to their owners to assist them in finding the animals following the emergency. The law requires parishes and local governments to evacuate people with service animals through the use of public transportation. Other animals will be allowed to ride with their owners on public transportation if there is space available and they are in crates. Otherwise, animals will be taken from their owners and sent to emergency shelters. This reunion provided essential closure for many of us, the resurrection of friendships and adventurous spirit and the refreshing satisfaction that Noah’s Wish funds will give Slidell Animal Control and the pets of this hospitable Gulf Coast community a new lease on life. And a feeling that the inspiring lessons of hope and dedication we take forward from the deployment will strengthen the foundation of our psychological landscapes forever. 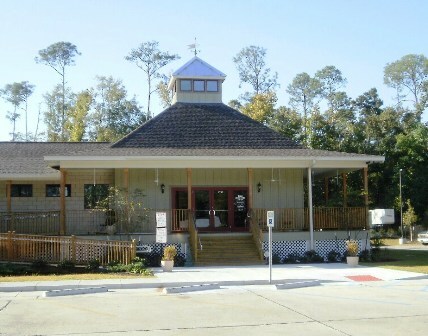 The Slidell Animal Control shelter, opened earlier this year, was built with $3 million donated by Noah’s Wish.